Calls for enhanced safety measures at the crosswalk have been renewed amid last night&apos;s fatal crash. BAYONNE — It’s 2 p.m. and Natajia Goodwin is heading to her job in the Bayonne Crossing shopping plaza. It’s not a particularly dangerous task, until she gets to Route 440. Goodwin, 24, waits at the intersection of East 22nd Street and Route 440 as cars whiz by, going 40 to 50 miles per hour. The light turns red and she walks across the thoroughfare. On Wednesday afternoon, Goodwin was one of dozens who crossed Route 440 to get to Bayonne Crossing. Several blocks north, even more pedestrians who crossed the busy — and sometimes deadly — state highway from 32nd Street to get to the South Cove Commons plaza. Calls for enhanced safety measures along Route 440 are being renewed in the wake of Wednesday night’s fatal crash, which claimed the life of a pedestrian who was struck between 21st and 22nd streets. The fatality is the 19th on Hudson County roadways this year, and the seventh since Aug. 31, according to New Jersey State Police statistics. At this point last year, there had been 22 fatalities in Hudson County. The victim, whose identity has not yet been released by authorities investigating Wednesday’s crash, is the fifth person to die in a traffic incident on Route 440 in Bayonne since November 2014. Tyler Sellers, 20, and Sabore Worrell, 24, were struck and killed while crossing the busy highway at Lefante Way on the night of Nov. 2, 2015. Authorities determined the driver, Waqas Ibrar, was traveling over 100 mph at the time of the crash. He was later found guilty of two counts of death by auto and was sentenced to 12 years in prison in February. Wednesday’s crash came just days after the third anniversary of the two friends’ deaths. On Thursday, Sellers’ father Jay said more should have already been done to ensure the safety of pedestrians — and motorists — on Route 440. Adding more sidewalks and crosswalks along the highway would be a good start, he said. “I’m devastated that another life was lost,” added Mary Sellers, Tyler’s step-mother. “It brought back a lot of horrific memories. There are only two crosswalks on the .9-mile stretch of Route 440 between 21st and 32nd streets (at 22nd and 32nd streets). Pedestrian bridges have been on the minds of city officials for some time now, but on Wednesday night the City Council approved two resolutions to go out to bid for a “local concept development study” for a pedestrian bridge over Route 440 between the 34th Street Light Rail Station and the former Military Ocean Terminal. Council President Sharon Ashe-Nadrowski said the bridge is still in the beginning stages and offered no timeline for completion. 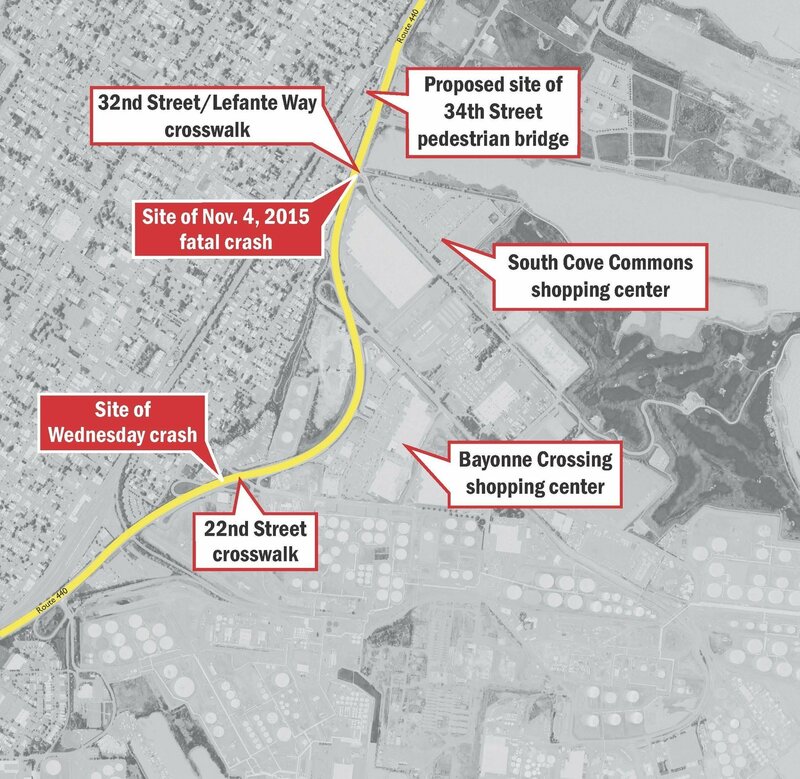 But she said there are currently no concrete plans to add any sort of safety measures to the two crosswalks near Bayonne Crossing and South Cove Commons. Spokespeople for both Mayor Jimmy Davis and the state Department of Transportation did not immediately respond to requests for comment on the pedestrian bridge plan. In January 2017, Davis said the city had approximately $4 million for construction from federal funds allocated through the state DOT and the North Jersey Transportation Planning Authority. Frank Alessi, head of the company that has developed much of the two shopping plazas, said they have written letters to the city in support of additional pedestrian crossings and bridges. “It makes sense, and as property owners we’re all for the state Department of Transportation and the city to support whatever decision they make in providing the appropriate crossing for pedestrians,” he said. It’s something that cannot be put off any longer, Jay Sellers said. Journal city editor Patrick Villanova contributed to this report.